Early Sunday morning, June 28, 1863, 5,000 of Confederate Gen J.E.B. Stuart's cavarlymen rode into Rockville and arrested Union supporters. 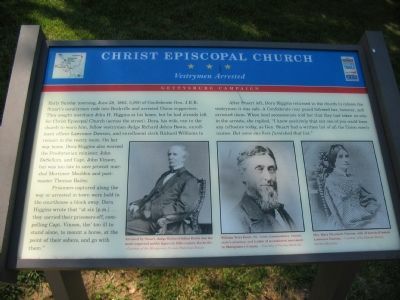 They sought merchant John H. Higgins at his home, but he had already left for Christ Episcopal Church (across the street). 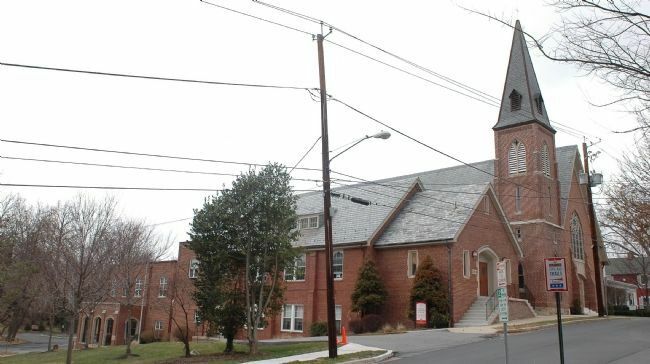 Dora, his wife, ran to the church to warn him, fellow vestrymen Judge Richard Johns Bowie, enrollment officer Lawrence Dawson, and enrollment clerk Richard Williams to remain in the vestry room. On her way home, Dora Higgins also warned the Presbyterian minister, John DeSellum, and Capt. John Vinson, but was too late to save provost marshall Mortimer Moulden and postmaster Thomas Bailey. Prisoners captured along the way or arrested in town were held in the courthouse a block away. Dora Higgins wrote that "at six [p.m.] ... they carried their prisoners off, compelling Capt. Vinson, tho' too ill to stand alone, to mount a horse, at the point of their sabers, and go with them." they had taken no role in the arrests, she replied, "I know positively that not one of you could have any influence today, as Gen. Stuart had a written list of all the Union men's names. But some one here furnished that list." Erected by Maryland Civil War Trails. Marker series. 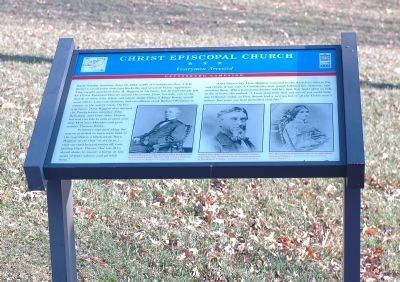 This marker is included in the Maryland Civil War Trails marker series. Location. 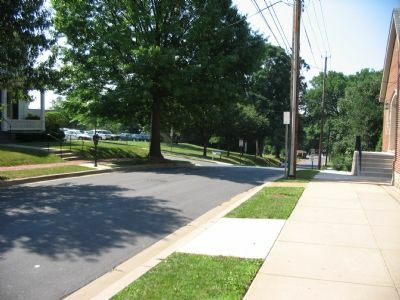 39° 4.94′ N, 77° 9.177′ W. Marker is in Rockville, Maryland, in Montgomery County. Marker is on South Washington Street near Vinson Street, on the right when traveling south. Touch for map. Marker is at or near this postal address: 109 South Washington Street, Rockville MD 20850, United States of America. Touch for directions. Other nearby markers. At least 8 other markers are within walking distance of this marker. A different marker also named Christ Episcopal Church (here, next to this marker); Dr. James Anderson House (about 300 feet away, measured in a direct line); Hungerford Tavern (about 300 feet away); Rockville (about 400 feet away); 1803 Plan of Rockville and Boundary Stone (about 400 feet away); Boundary Stone (about 400 feet away); “Out of Robb’s Window, Montgomery County Courthouse.” (about 400 feet away); Hungerford Tavern Site (about 400 feet away). Touch for a list and map of all markers in Rockville. Arrested by Stuart, Judge Richard Johns Bowie was the most respected public figure in 19th-century Rockville. Courtesy of the Montgomery County Historical Society. William Veirs Bouic, Sr., town commissioner, lawyer, state's attorney, and leader of secessionist movement in Montgomery County. Courtesy of Peerless Rockville. Mrs. Mary Elizabeth Dawson, wife of arrested lawyer Lawrence Dawson. Courtesy of the Dawson Family, Peerless Rockville. More. Search the internet for Christ Episcopal Church. Credits. This page was last revised on June 16, 2016. This page originally submitted on January 16, 2006, by Tom Fuchs of Greenbelt, Maryland. This page has been viewed 2,573 times since then and 23 times this year. Last updated on November 5, 2010, by Timothy Carr of Birmingham, Alabama. Photos: 1. submitted on January 16, 2006, by Tom Fuchs of Greenbelt, Maryland. 2. submitted on July 15, 2007, by Craig Swain of Leesburg, Virginia. 3. submitted on July 7, 2007, by Craig Swain of Leesburg, Virginia. 4. submitted on January 18, 2006, by Tom Fuchs of Greenbelt, Maryland. • Craig Swain was the editor who published this page.